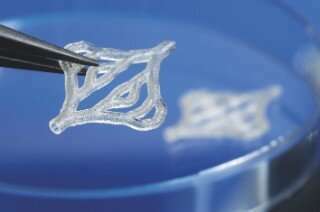 Either fast or precise – both cannot be achieved in the production of the finest polymer structures with the laser. Or maybe they can? 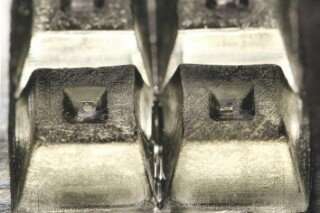 Combining stereolithography and multiphoton polymerization should make it possible: Scientists at the Fraunhofer Institute for Laser Technology ILT are developing a machine for high-precision, cost-effective 3-D construction technologies using both methods. 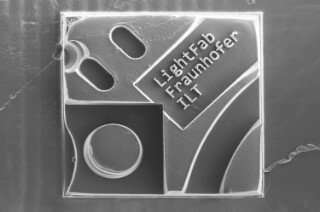 On November 1, 2018, Fraunhofer ILT and its project partners launched the project "High Productivity and Detail in Additive Manufacturing through the Combination of UV Polymerization and Multi-Photon Polymerization – HoPro-3-D", which is funded by the European Union and the state of North Rhine-Westphalia. In the SLA process, a UV laser writes a two-dimensional structure in a resin bath, causing the photosensitive material to polymerize. The component is lowered step by step and a 3-D structure is built up in layers. For the most part, the build-up rate is well above 1 mm³ per second. Newer 3-D printer use UV LED light engines and a DLP (Digital Light Processor) chip instead of the scanner. This allows the exposure to be parallelized, thus increasing the build rate. Both methods achieve a maximum resolution above 10 μm. "The advantage lies in the interplay between the two procedures: Depending on the need, we intend to switch between the exposure systems in the process," explains Dr. Martin Wehner, HoPro-3-D project manager at Fraunhofer ILT. "The challenge we face is in process control. The concept has been developed, currently an appropriate machine is being built." The fields of application are manifold, but this machine should prove most interesting for the production of components used in biomedical analysis technology. Support scaffolds for 3-D tissue models, micromechanical components or complete microfluidic systems are typical application examples for this.